This is a long overdue post about the varnish on our beloved shabti box (in my last post I referred to the box as troubled…I’ve developed a tiny bit of a love-hate relationship with it, which I’m only now admitting). Anyway, I’ve briefly mentioned that we believe that the varnish on our shabti box is a pistacia resin, but how did we come to this conclusion? 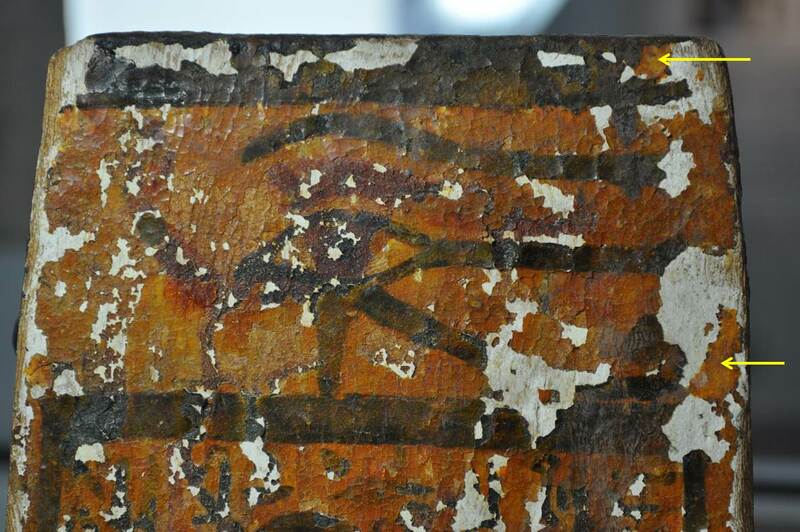 I started out by doing some research into similar objects, and into painted wood from the New Kingdom in general. 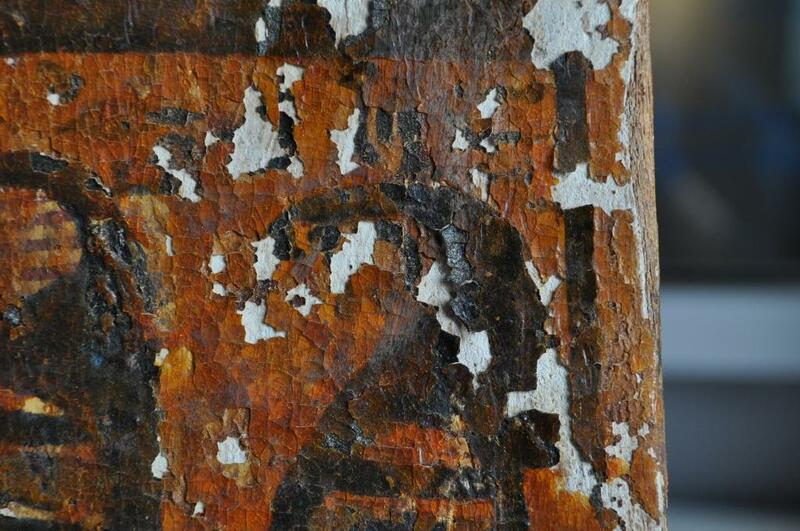 As I mentioned in a previous post, we know that some painted wooden objects were varnished with pistacia resin during this time period, and these varnishes often look like the coating we see on our shabti box. But there were some things about the coating, including the fact that it was actively flaking, and the fact that there are areas on the box where the paint is lost and where the coating extends over the loss onto the gesso below, which is strange. In order to start characterizing the coating, I looked at the box under different light sources and did a microchemical spot test, all described here. All roads were leading toward the conclusion that the coating is pistacia resin, but since we had so many available samples (i.e. detached pieces of the varnish) I wanted to investigate further. 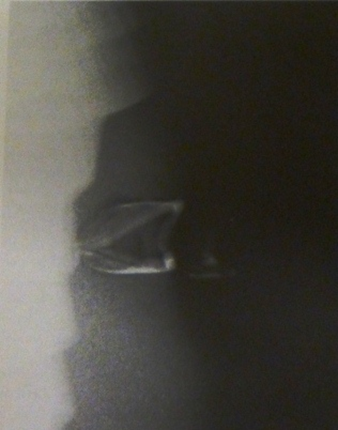 FT-IR spectra for samples of varnish from the shabti (top) and the shabti box (bottom). The characteristic peaks are labeled on the top spectrum. 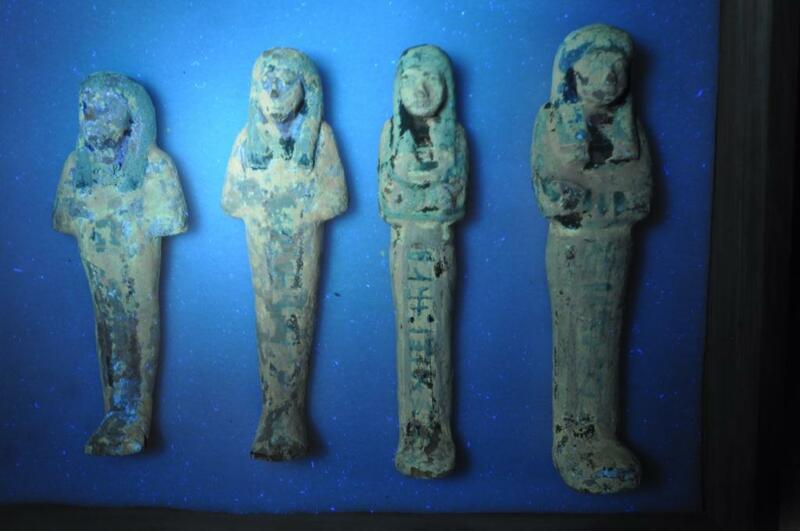 They look virtually identical, which confirms that the varnish on the box is the same as the varnish on the shabtis. 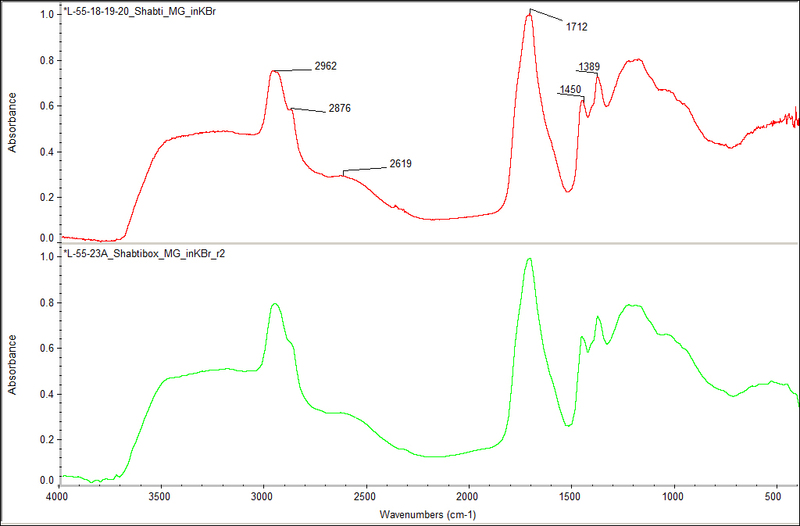 Dr. Hall then compared the spectrum for the shabti box sample to spectra for mastic (Pistacia lenticus) and terebinth (Pistacia terebinthus), both pistacia resins. 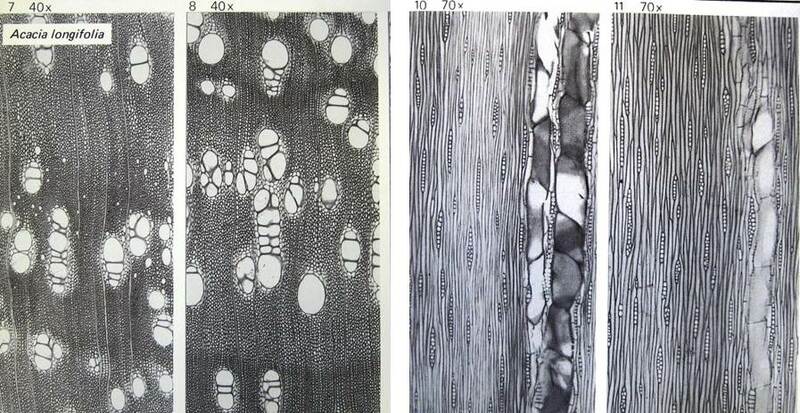 They all look very similar, with characteristic resinous acid peaks that occur between 1700 & 1720 cm-1 (carbonyl stretching) & the acid OH stretching that occurs ~1460 cm-1. 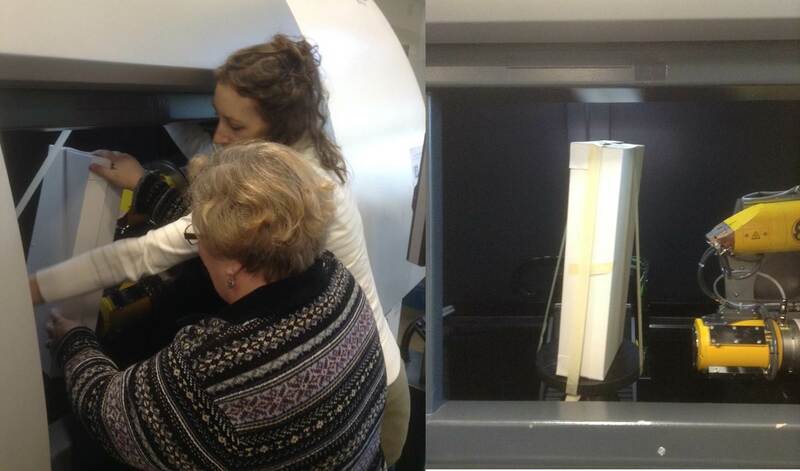 In order to see if we could classify the shabti box resin even further, Dr. Hall took a sample to Dr. Chris Petersen, Affiliated Associate Professor in the Winterthur/University of Delaware Program in Art Conservation (WUDPAC), where they analyzed it using Gas Chromatography-Mass Spectrometry (GC-MS). 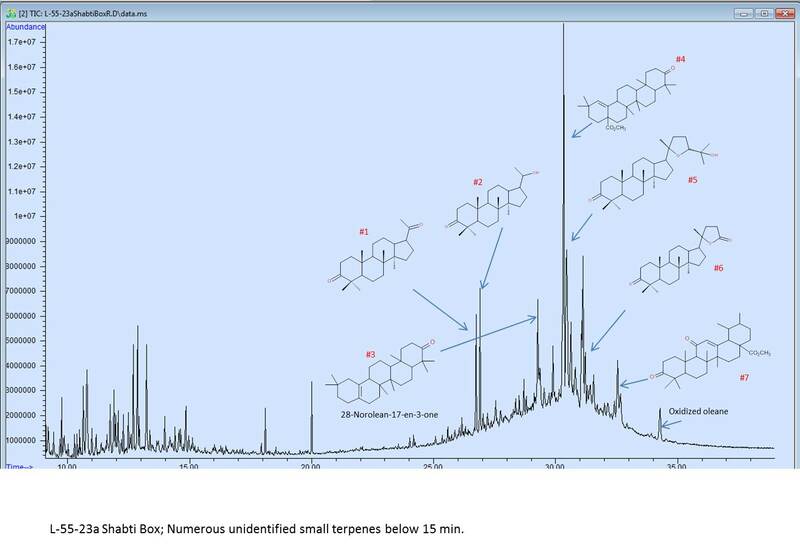 GC-MS is a technique that combines 2 methods of analysis, and in conservation we use it to analyze organic compounds. Dr. Petersen labeled the peaks and included their structures. 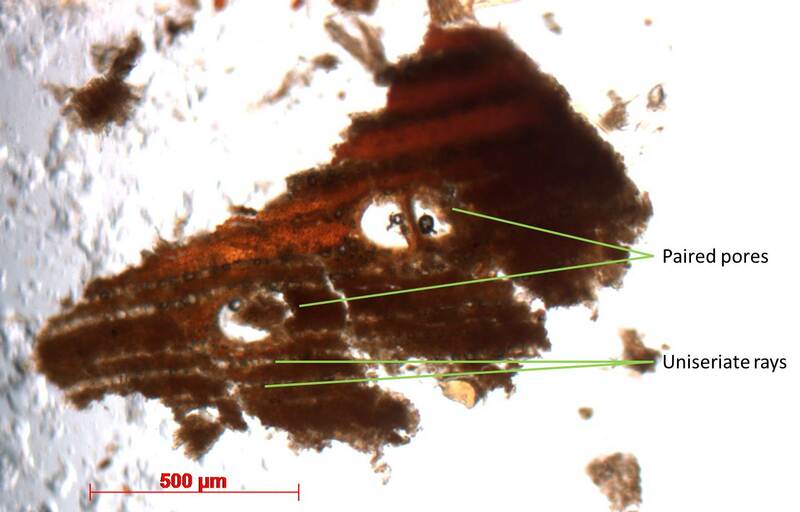 The structures are consistent with pistacia resin, either mastic or terebinth. 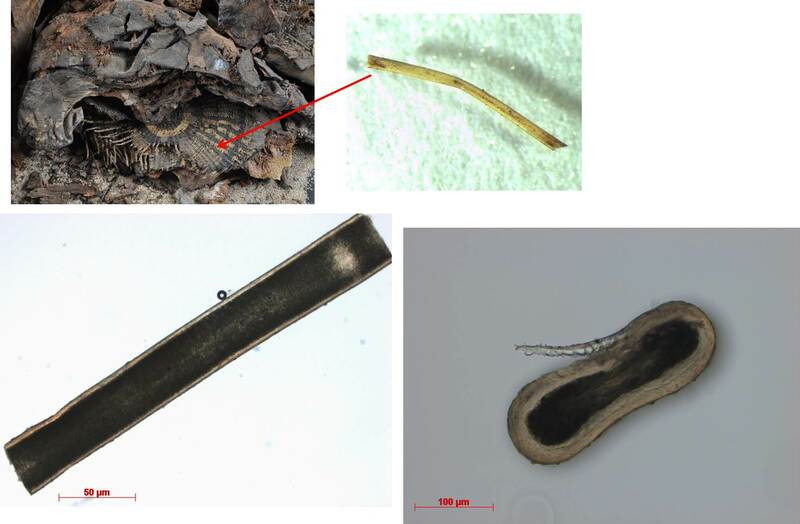 They did identify a peak for 28-norolean-17-en-3-one (#3 above), characteristic of heated pistacia resin, which could indicate that the resin was heated before application (which would have turned it from clear to a yellowed varnish). 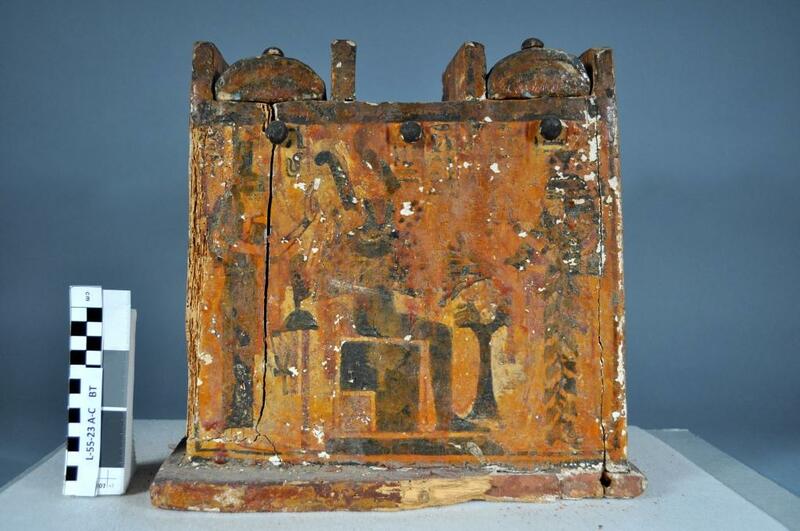 We cannot be certain what color the varnish was when it was first applied, but the analysis does confirm the fact that the shabti box and the shabtis all have aged pistacia resin coatings. We are grateful to both Dr. Hall and Dr. Petersen for their work on this analysis! 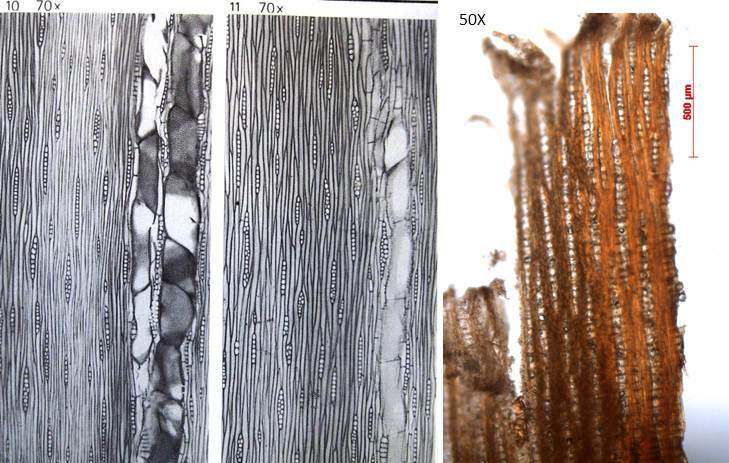 Motivated to learn more about the fur and animal hair found in our Predynastic mummy bundle, I popped up to Boston yesterday for a workshop entitled “Identifying collagen-based materials in cultural objects using peptide mass fingerprinting“. 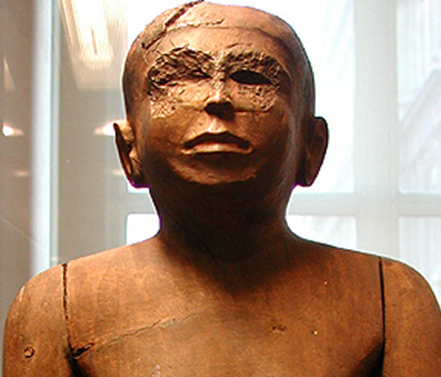 The workshop was organized by a group at Harvard, including the Peabody Museum of Archaeology and Ethnology in collaboration with the Straus Center for Conservation at the Harvard Art Museums and the Harvard FAS Division of Science. The team received NCPTT funding for a project to develop a new application of an analytical technique called peptide mass fingerprinting (PMF). 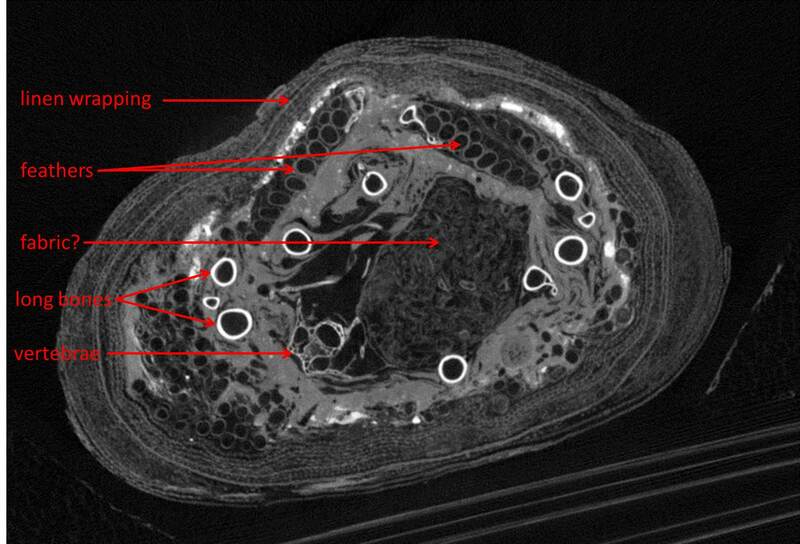 PMF uses mass spectrometry to analyze very tiny samples of proteinaceous objects and identify the mammalian source to the species level. It actually can be used to analyze materials made of collagen and keratin, but the group at Harvard is focusing on collagen-based materials. The procedure essentially breaks up the protein into smaller peptides, and the mass of the peptides is measured using a mass spectrometer such as a MALDI-TOF. 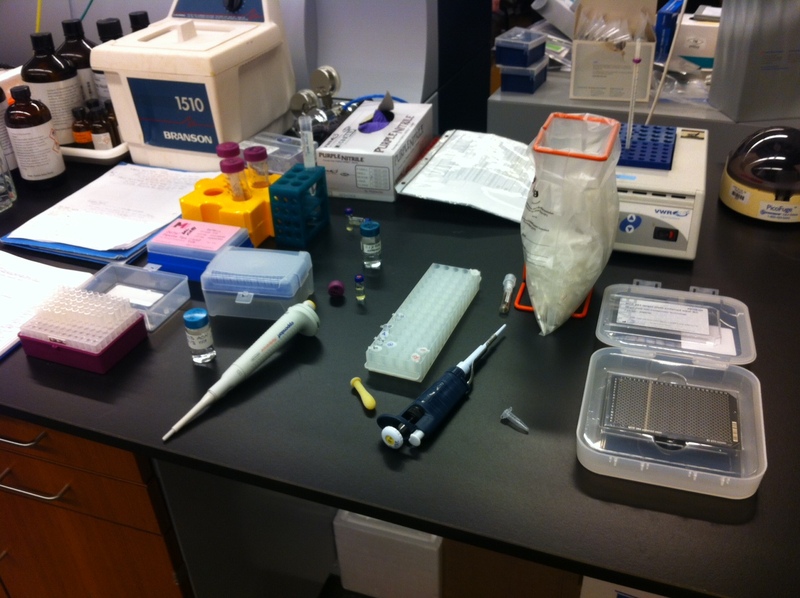 The peptide masses are compared to known reference samples, which allow for identification. This type of analysis falls under the category of proteomics, or the large-scale study of proteins, and it is sometimes referred to by this name as well. The Harvard project is focused on applying this technique to objects made of gut, skin, sinew, and membrane from Alaska, the Northwest Coast, Northern California, and the High Plains. 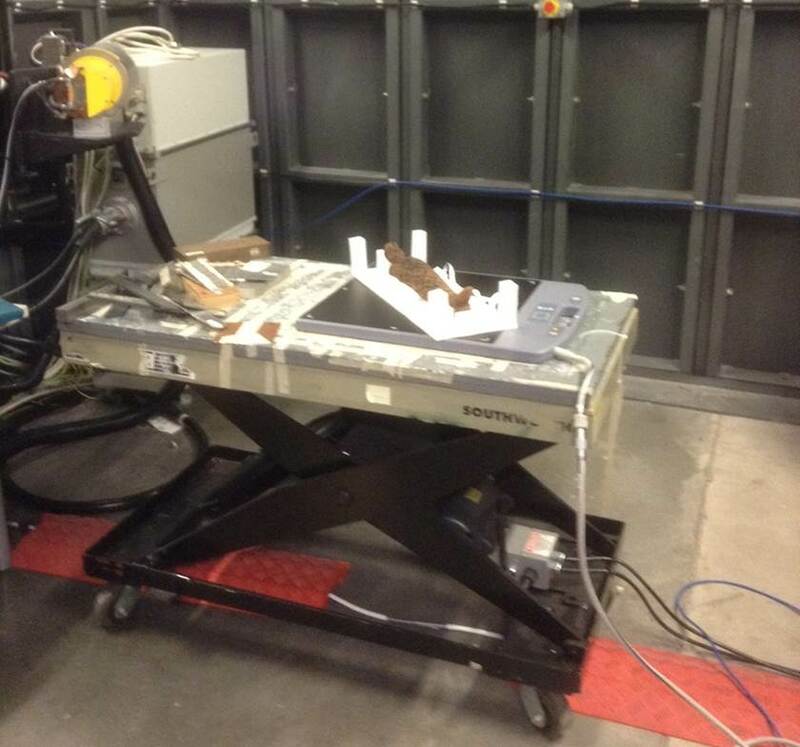 Another goal of the project is to bring this type of analysis, which typically takes place in large industrial or academic labs, to museum labs. You can learn more about the project on their blog. The workshop included 3 presentations by the project’s primary analytical investigator/scientist Dr. Dan Kirby, project research associate Madeline Corona, and Kress fellow Ellen Promise. Between the 3 of them, they covered how PMF works, what it can tell you, and how it is applied to cultural artifacts, using a project on Alaskan kayaks as a case study. 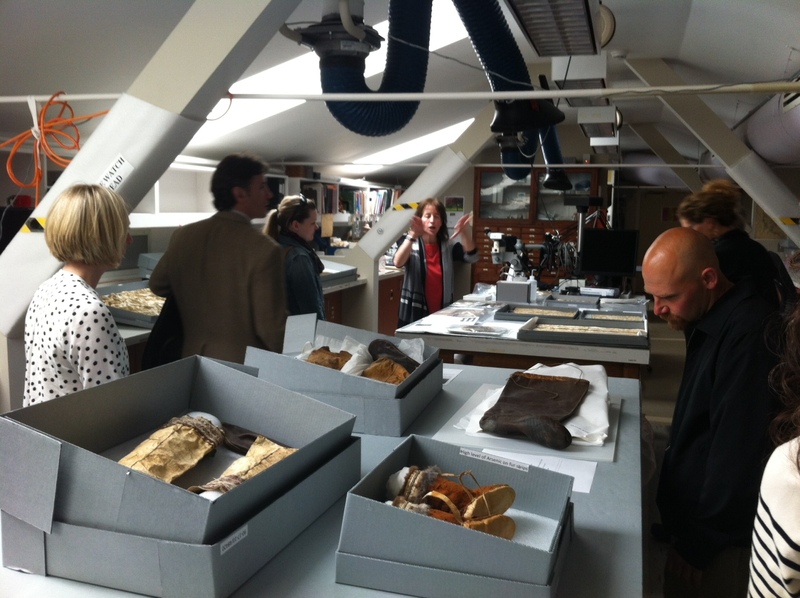 After Q&A led by Peabody Museum conservator T. Rose Holdcraft, we were led on a tour of the Peabody conservation lab, where we were able to feast our eyes on some of the impressive Native Alaskan objects that they are investigating as part of the project. 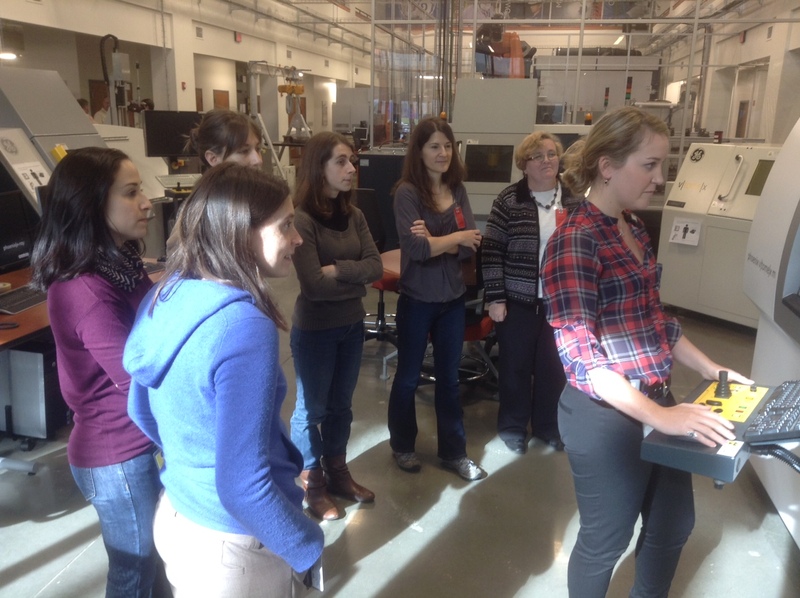 We also toured the impressive Mass Spectrometry and Proteomics Resource Lab, where we had a chance to see the Bruker MALDI TOF/TOF instrument and a demonstration of how samples are prepped for analysis. 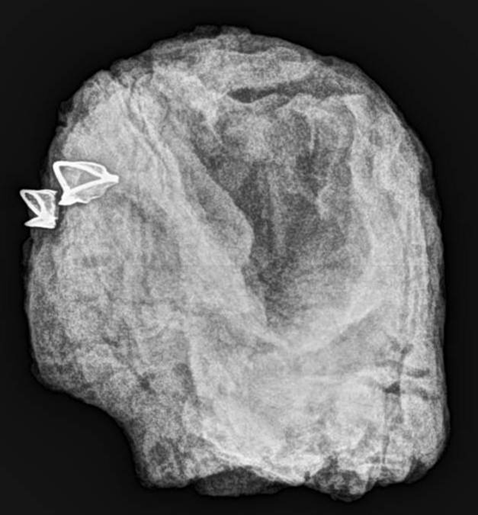 Here at Penn, we are excited by this technique – not only for the minute sample size required (the samples used are just barely detectable to the naked eye) but also for its accessibility. 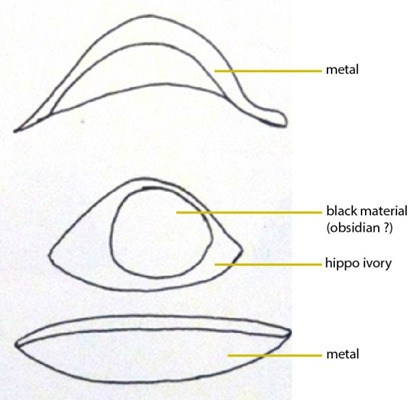 We have a lot of animal-based materials in our collection and we are hoping to pursue using PMF to analyze these materials. 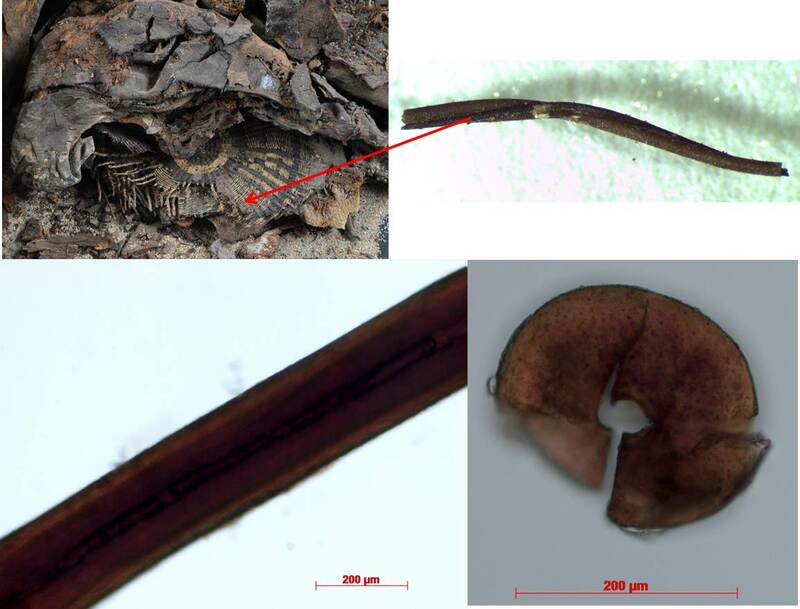 Actually, we are already working to see if its possible to use this technique to identify the sources of the fur and basketry hair fibers from our Predynastic mummy, thanks to help from Smithsonian MCI fellow Caroline Solazzo, whose work focuses on keratin-based materials. 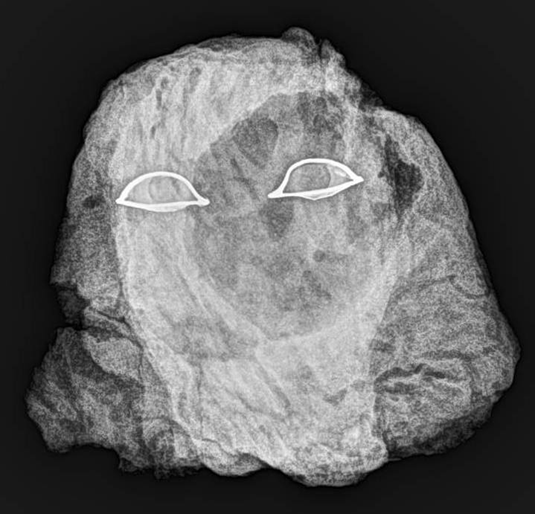 PMF supposedly works on all types of samples, including those that are very old and/or are in poor condition, so we thought we’d put this to the test by starting with samples from our oldest Egyptian mummy (he’s well over 6000 years old). We will let you know how it seems to work. 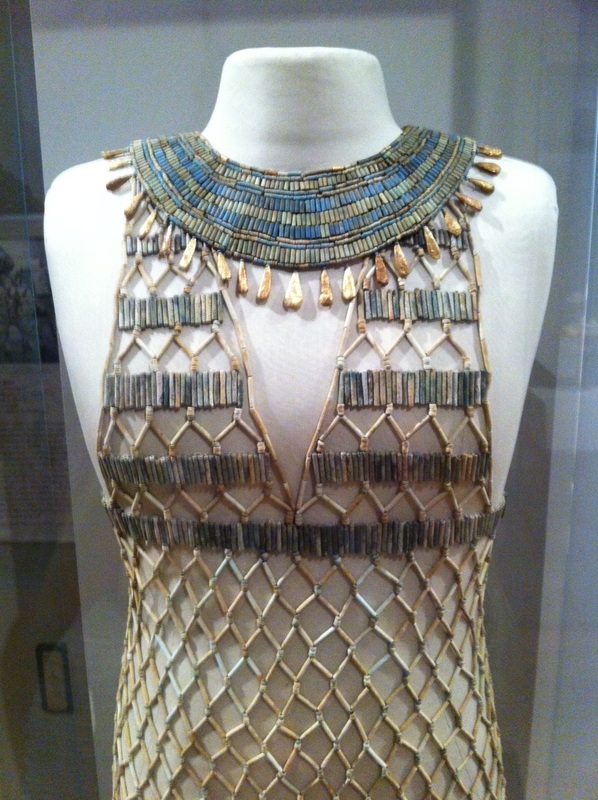 and many of the other treasures of this collection, such as this bead net dress made of faience and gold from the 4th Dynasty. Breathtaking, really. I also found this shabti in a miniature coffin very charming. And while the MFA does not have conservators working in a gallery, as we are doing here at Penn, they do have some great “behind the scenes” galleries, one with interactives that engage visitors to think about conservation ethics and decision making. 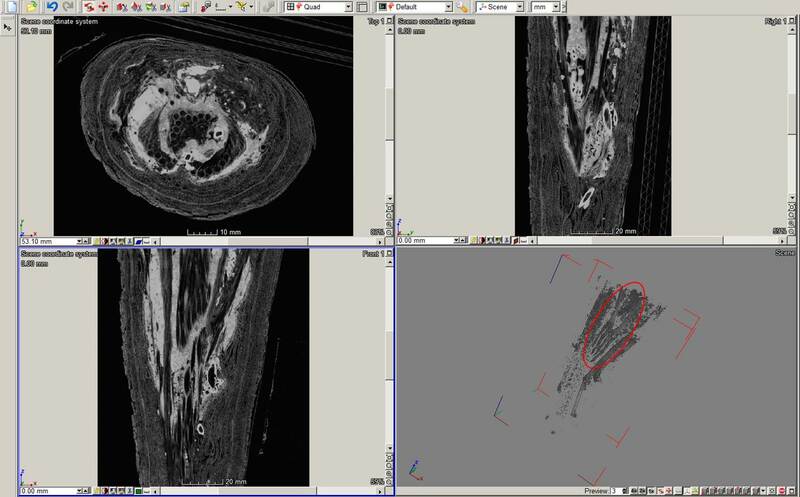 One of my favorites was an example using Maya Cylinder vases, examining condition issues and treatment decisions. All in all, a great trip. We’ll keep you updated on the whole peptide mass fingerprinting technique and how we might be able to use this for our collection. 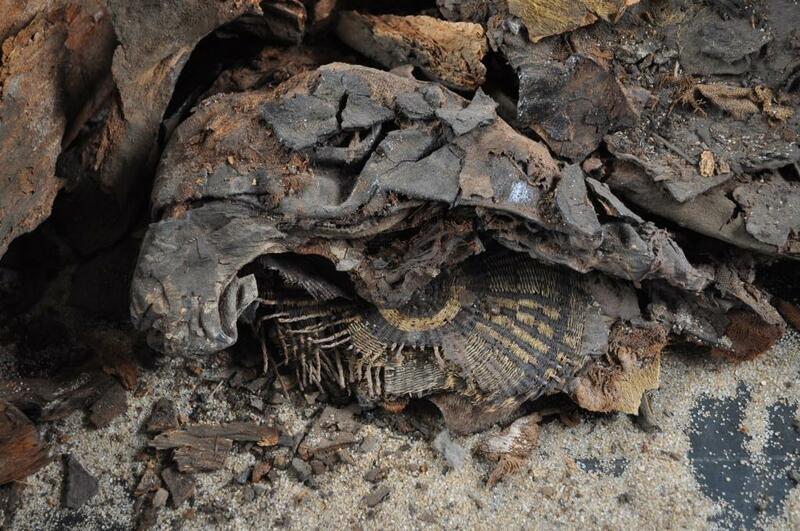 While we continue to work on the conservation of PUM I‘s remains, we also have been taking this opportunity to carry out some analysis on the residues and substances preserved on his wrappings and on the beads that once made up his beaded burial shroud. 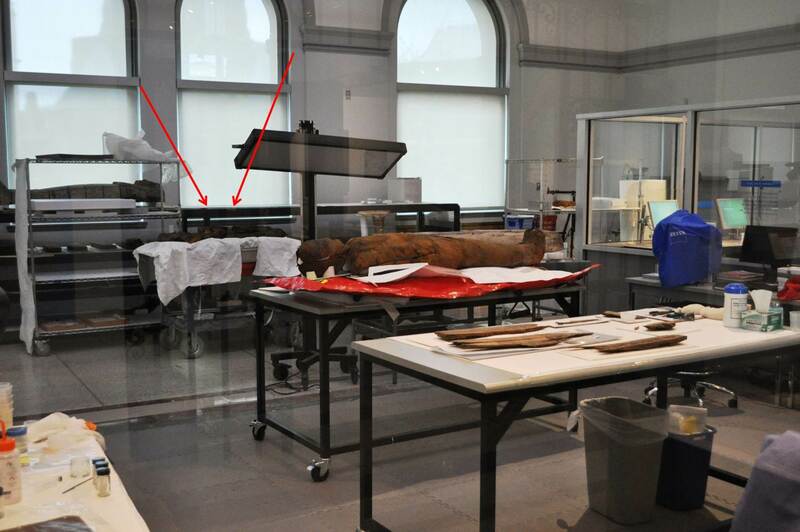 This material does not appear to be dirt or accumulated debris from the mummy. 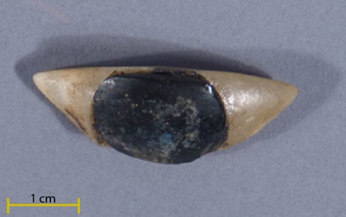 But, it can be removed rather easily from the beads, especially with the help of some mineral spirits, which suggested to me that it is some sort of wax. 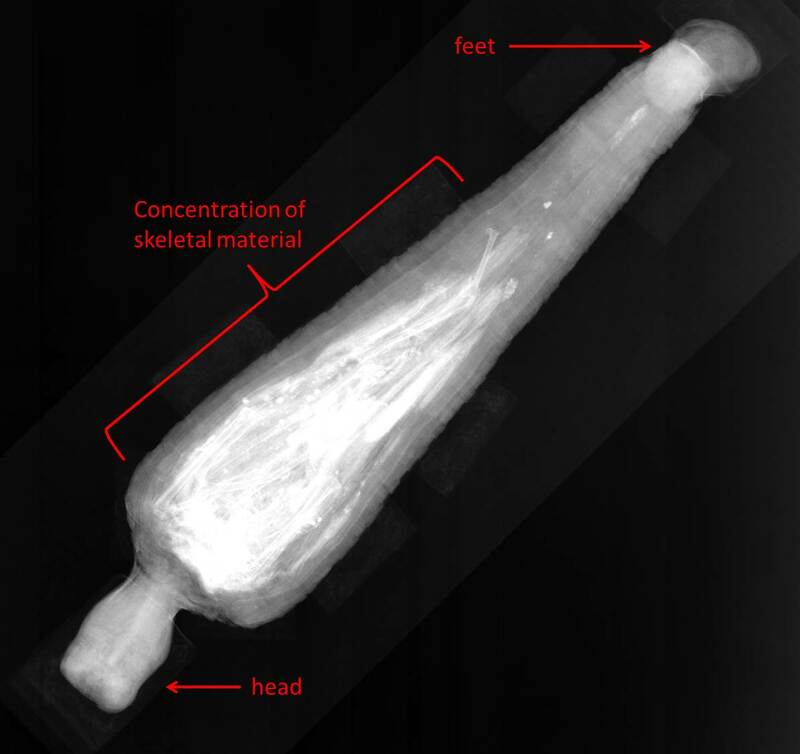 Based on this information, I was suspecting that either this material was related to a substance applied to the beads to help the beaded shroud stay in place at the time of burial (but we have yet to locating any research supporting this theory – it was more common to sew or tie these beaded shrouds in place) or that it is related to a substance applied to the shroud at the time of discovery, to assist with the removal of the shroud. 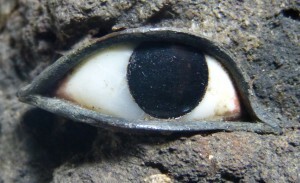 In conservation, when it comes to investigating unknown, likely organic substances, there are several analytical techniques that can be helpful. 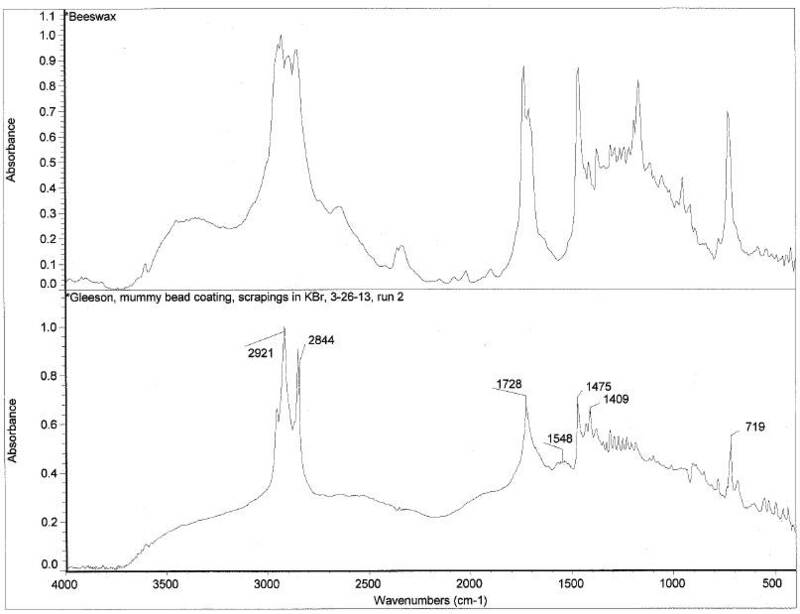 One of these techniques is Fourier-transform infrared (FTIR) spectroscopy. 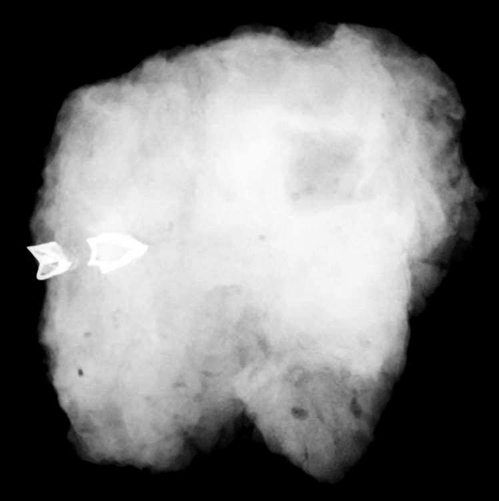 FTIR works by exposing a sample to infrared radiation, which causes the sample to selectively absorb radiation, depending on the molecules present. 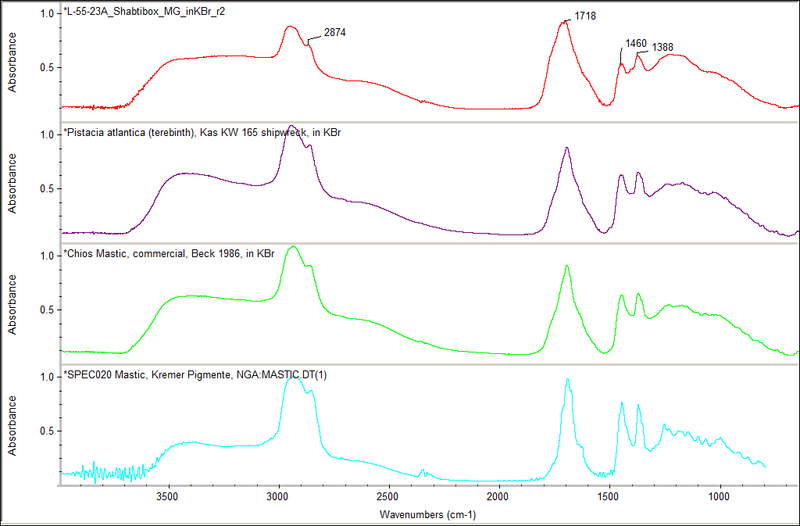 The individual peaks in the resulting absorption spectrum can be analyzed or the spectrum can be compared to reference spectra to help characterize or identify a material. This spectrum shows that the sample is mostly organic as evidenced by the dominant peaks in the 2900 cm-1 region which are characteristic of C-H bond stretches. In addition, there were many peaks in the “fingerprint” 1800-1000 cm-1 region where various organic molecules absorb. 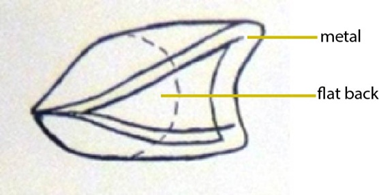 The absorption around 1730 cm-1 (due to C-O double bond stretches) suggests organic acids are present, possibly from resins or beeswax. Both of these families of compounds would also have bands around 1470 (a O-H bending absorption) which are seen in our sample. Importantly, the sample also shows a strong band around 720-730 cm-1 (due to the C-H in long hydrocarbon chains) which is only present in beeswax. Based on this analysis, our “bead coating” sample likely contains some beeswax, which is consistent with our observations of the solubility and consistency of the material as well. 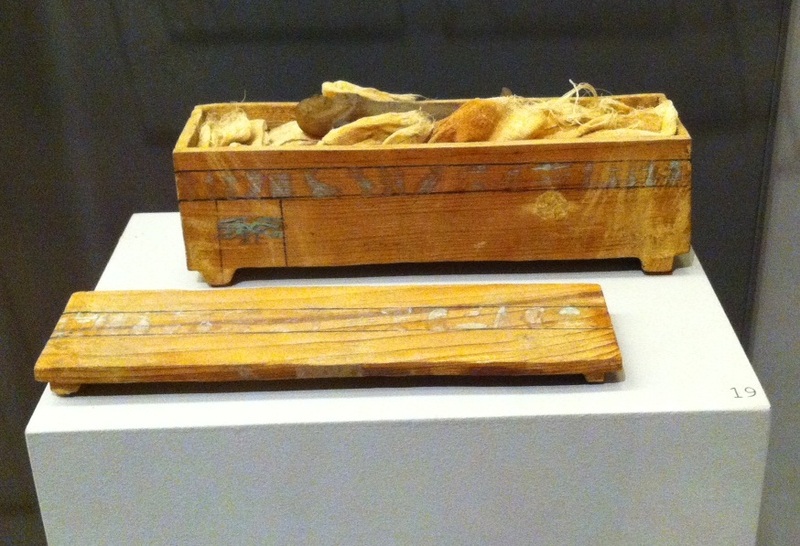 It is known that beeswax was used in ancient Egypt – as an adhesive, a sealant, a binding medium, and in the mummification process. Bees were considered by the Egyptians to be precious insects with magical and economic prestige, and these values would have extended to their wax (Ikram and Dodson 1998). For a more definite identification of our sample, the next step would be to analyze the material using gas chromatography–mass spectrometry (GC-MS). 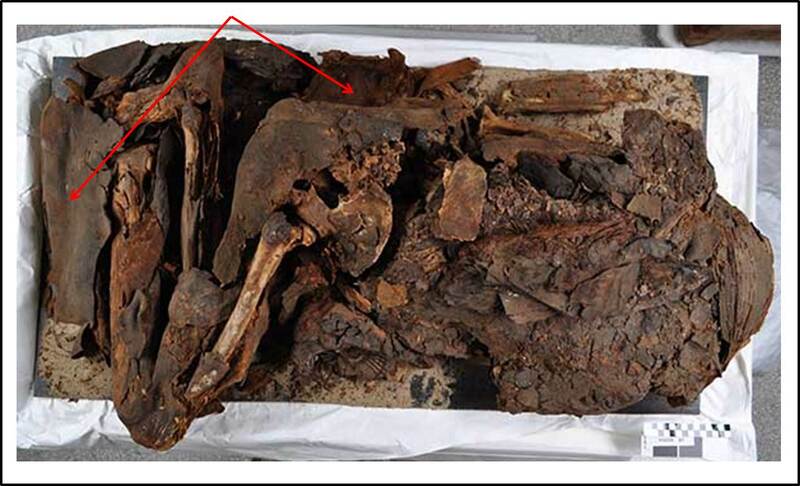 Special thanks to the Biomolecular Archaeology Lab and Dr. Gretchen Hall for running this sample and providing the analysis. 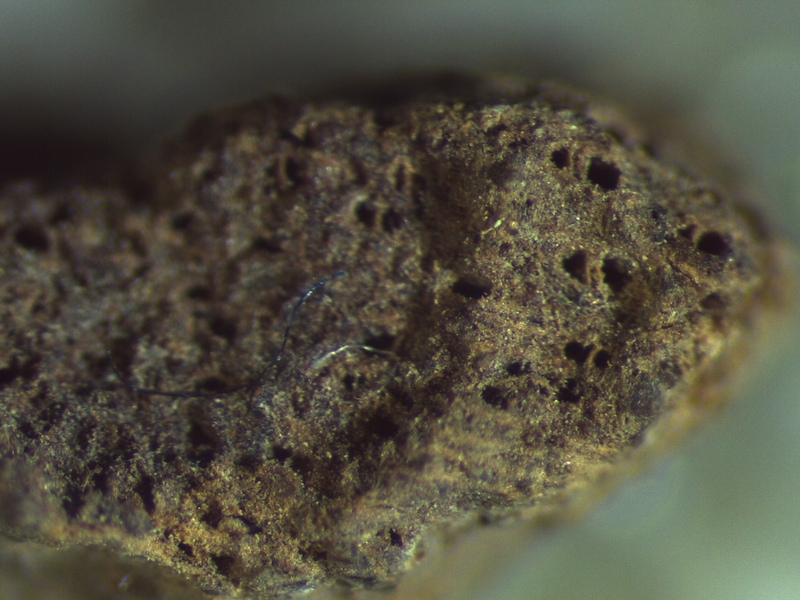 Today I decided to do a chemical spot-test to see if I could determine if the fiber was cellulose or protein-based. 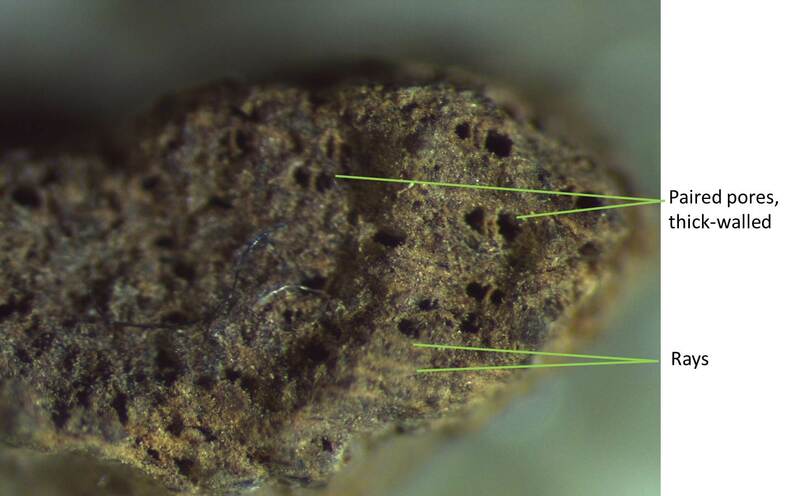 Chemical spot tests are inexpensive, generally simple procedures that conservators may use to characterize materials on artifacts. 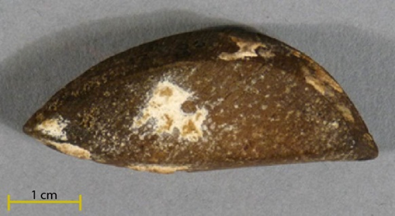 These spot tests are often carried out on small samples removed from artifacts using chemical reagents. 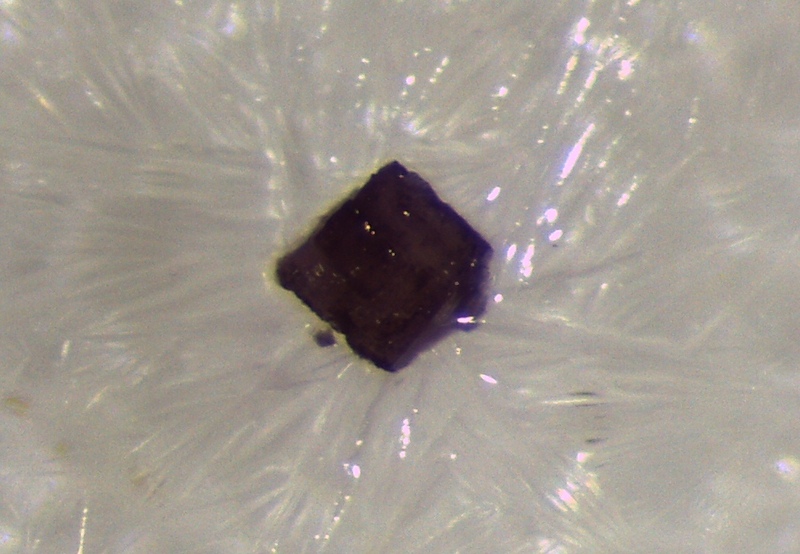 In the case of my mystery fiber, I cut a small piece off of one of the fiber samples I previously examined under the microscope-this small piece was enough for a spot test, and there was no need to remove more material from the coffin in order to do this. The first test I chose to carry out was the Biuret test for protein (according to instructions in Material Characterization Tests for Objects of Art and Archaeology), using copper(II) sulfate. After placing a drop of copper (II) sulfate solution on the sample, I waited for a few minutes, then soaked up the excess solution and added a drop of sodium hydroxide solution to the sample. It immediately turned purple (see below), which indicates the presence of protein (and just in case it’s not clear on your screen, believe me, it is purple!). What this means is still unclear, but it’s another clue. It is possible that my earlier comparison of this fiber to sinew was not a bad suggestion! But it’s also possible that this fiber was coated in a protein-based glue before it was incorporated into the gesso (or something like this).